1968 Pontiac GTO 2 Door Hardtop-Period Correct 400ci V-8 350 HP Motor Rebuilt w/3,100 miles, Car has 57,450 Orig. Miles, Original 3-sp Auto Transmission W/Hurst Dual Gate Shifter & 10 Bolt Rear End. Original: Rochester Guadrajet Carburetor, Interior, Rally Wheels & AM Radio. Upgrades include Front Disc Brakes, Hidden Headlights & Hood-Mounted Tachometer. New Tires in 2014 with only 300 miles, Power Steering, No AC. Current 3rd Owner has kept Car garaged for the past 25 Years and only drove it to local Car Shows. Motor Trend Car of the Year in 1968. 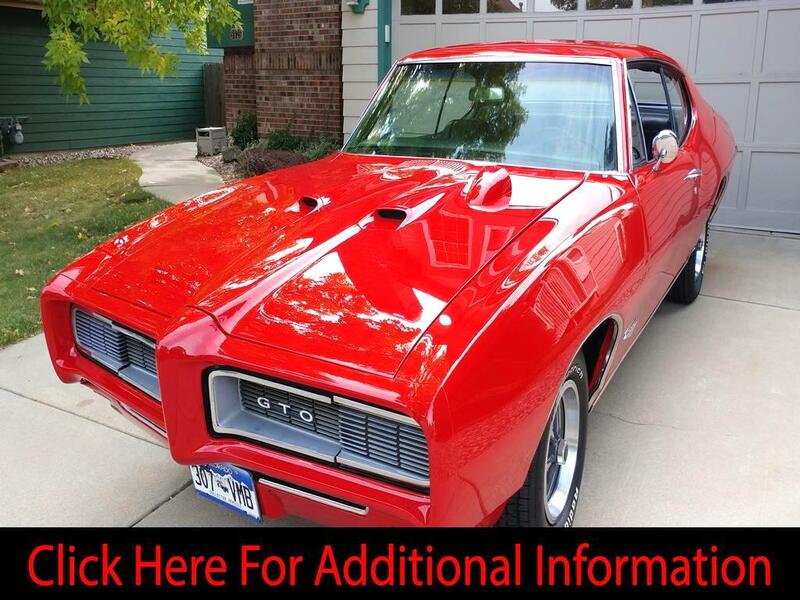 This 1968 GTO is in Exceptional Condition and has been Babied over the past 25 years! Owner just doesn’t drive it much so it’s time for someone else to have some fun with this car.